Morning!! 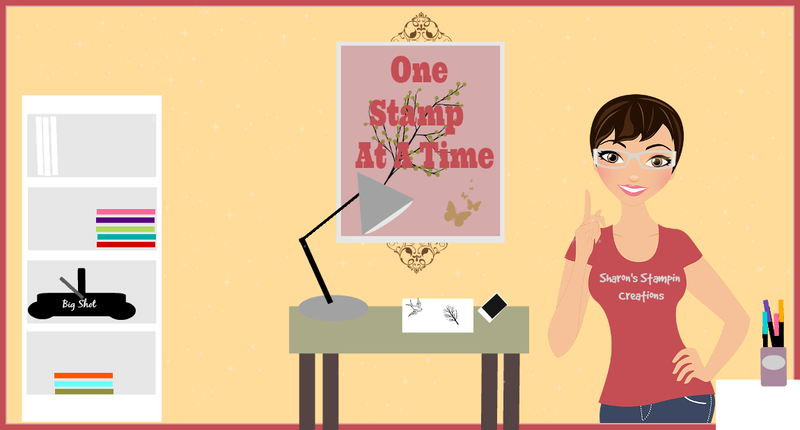 It's Monday and that means we are starting a new challenge at Bitten By The Bug 2. Our wonderfully talented DT Sister Mayra is hosting this weeks challenge. She has challenged us and you to use a Cricut frame on your project. Now I really wasn't sure what I wanted to do with this challenge. I checked out the frames that are on the Elegant Edges cartridge. I picked one out, cut the back of it. When I started cutting the top piece with the design on it, it got chewed up. Well, the design did. Tried again, and it happened again. So I decided that I would just use the back piece. I then used the Birthday Bash cartridge and cut the Happy Birthday sentiment. I popped up the frame and glued the sentiment to the card front. The bg designer paper is from My Mind's Eye-Happy Day 6x6 pad. The dots are from Doodlebug Designs Inc.-Snow Flurry Sprinkles. 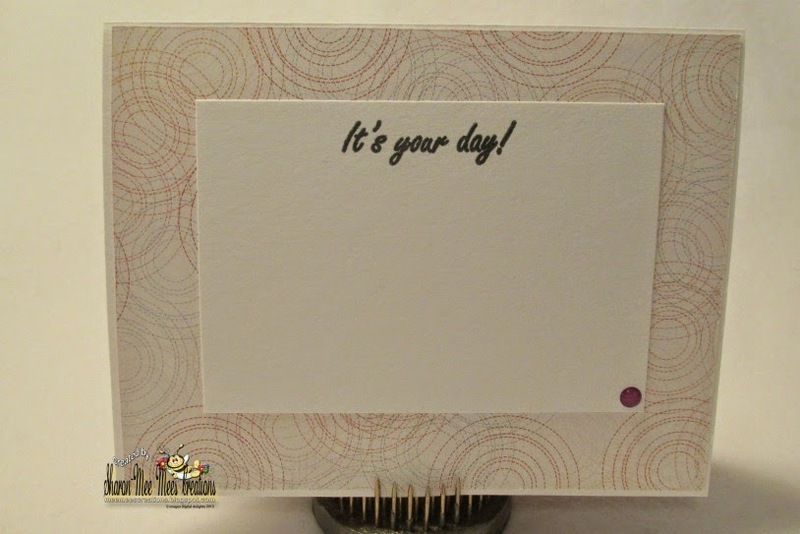 The inside sentiment is from the 'Make a Wish' stamp set from Mary-Cardz TV Stamps. Hope you head over to Bitten By The Bug 2 and check out the projects that my DT Sister's have made. Awesomeness for sure!!! While you are there, look in the sidebar at the rules for our challenges. Then how about heading to your crafty space and create a project using a Cricut frame cut. Looking forward to seeing what you come up with. This paper is so pretty and I love this frame so much! Beautiful birthday card! Sometimes you just have to adapt on the fly and make a project work-and I never would have guessed you had to use a different cartridge completely to finish your projects so this turned out well!!!! It looks like it was made to be that way! I love that pop off purple!! Super cute card!! Hugs!! Sounds like you had a time getting there, but once you got there...WOW! 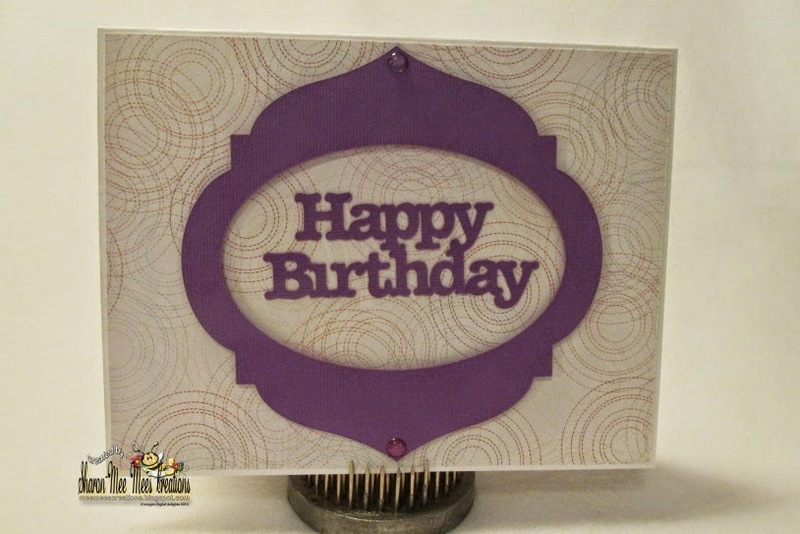 This is really a lovely card, the purple just pops and the frame turned out so pretty! yes - it is an elegant frame. nice colors. Like your Easter cards too. This is really pretty Sharon , that is a beautiful frame. What a pretty card~gorgeous frame Sharon! Love how you framed your sentiment! Super cute!! Such an elegant and beautiful card !! !